SunPower solar panel array has a world leading solar energy conversion efficiency, 36 watt SunPower solar array is 21.5-23.5% efficient, providing enough power to charge two devices simultaneously. USB port(5V/2.7A) with iSolar Technology for charging your 5V powered gadgets, and 18V DC output(18V/1.5A) for charging your laptop or 12V storage battery. Smart IC Circuit with waterproof treatment and rugged high-wear PVC fabric canvas, provide you with worry-free in any outdoor environments and activities, including water sports, thunder storm, high humidity weather. Will recharging immediately and quickly whenever there is sunshine. The canvas is created to withstand rugged durability for outdoor use. with Ultra lightweight (20 oz) and ultra compact (11.8 x 6.5in folded or 22.8 x 11.8in opened) design, it easily fits in your backpack. 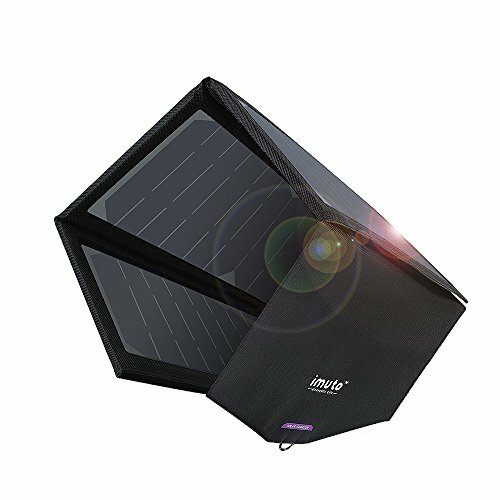 High Efficiency: Foldable Solar charger panel bag--For camping, hiking, climbing or any outdoor activities, with a 22-25% solar efficient. Wide Compatibility: Wide Compatibility: USB Port: ipad Air mini, iPhone 7 plus 6s 6 plus, Samsung Galaxy s6, Blackberry, bluetooth headset, ipod digital products and any other 5V USB devices. DC port: charging 18V1.5A laptops, 12V car battery and other 18V 1.5A DC-powered devices. High Quality: The canvas is created to withstand rugged durability for outdoor use. PET laminated solar panels with high-wear PVC fabric, ensures waterproof and weather-resistant durability. Compact size design for portability, with the free hook, you may just hang it on your bagpack when outdoors, great for any outdoor trips/activities. If you have any questions about this product by imuto, contact us by completing and submitting the form below. If you are looking for a specif part number, please include it with your message.